Division of Music | Jacksonville University in Jacksonville, Fla. The JU Music Advantage: Personalized Attention. Professional Preparation. Innovative Programs. Music plays an important role at Jacksonville University. With a distinguished faculty of professional performing artists and scholars, a low student-teacher ratio, generous talent scholarships for music majors, outstanding performance facilities including the newly-renovated Terry Concert Hall, and a beautiful oak-lined campus on the banks of the St. Johns River, Jacksonville University is the perfect environment for you to focus and refine your skills while deepening your appreciation for the art — all in the context of a selective, private and comprehensive liberal arts university. Star in an Opera or Musical. Perform with our Jazz Combos, Jazz Orchestra, Choirs, Marching Band, Percussion Ensemble, Chamber Ensembles, Orchestra, and Wind Ensemble. Produce and record albums in our recording studios, which are released on our record label Dolphinium Records. Take advantage of cross-disciplinary opportunities in the Linda Berry Stein College of Fine Arts — a place where dance, music, theater and visual art intersect in a dynamic creative community. A liberal arts degree offering concentrated musical study within a broad liberal arts course of study. The B.A. degree prepares graduates for careers in the private and non-profit sectors, or for further graduate study. A professional interdisciplinary degree designed to prepare graduates for professional work in Music Theater, incorporating extensive musical training with dance and theatre. A professional degree with concentrations in Vocal, Instrumental and Piano Performance, Composition, and Jazz/Commercial Music that prepares students for graduate study and for careers as performing artists. A professional degree designed to prepare graduates to teach K-12 Music in public and private schools. Upon successful completion of degree requirements, candidates are prepared to earn teaching certification through application to the Florida Department of Education. A liberal arts degree with concentrations in Management and Music Technology designed to prepare graduates for successful careers in the music industry. Jacksonville University is an accredited institutional member of the National Association of Schools of Music (NASM). 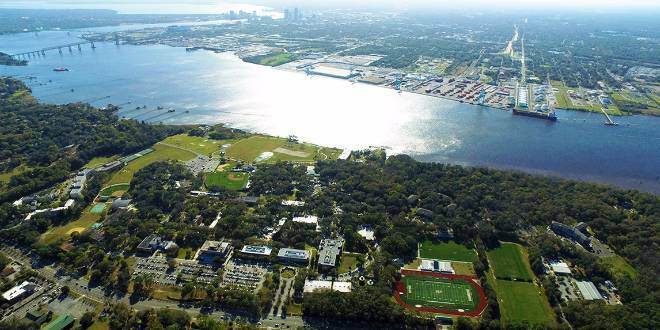 The Division of Music at Jacksonville University fosters a community of engaged performers, pedagogues and entrepreneurs within the framework of the liberal arts setting. Our students and faculty are critical thinkers, collaborative artists and community ambassadors. We prepare our students (pre-professionals) for life long success in the evolving field of music in the 21st Century. The Music Division at Jacksonville University will be a leading music program among its peer institutions distinguished by the depth and breadth of its innovative programs.